I decided to start varnishing the hull while waiting for the screws I ordered so I could attach the gunwales. I wasn’t anticipating the absolute change in appearance this would cause. The wood I used for the hull, Spanish cedar, was hinting at having an abundance of figure, or chatoyancy, in its unfinished state. Sure enough, as soon as the first coat of varnish was applied, the appearance of the wood “popped” as some woodworkers call it. The wood took on a depth or three dimensional appearance. There was even some “birds eye” in one of the planks. This sort of figure is seldom, if ever, seen in guideboat planking. Why is that? The reason is that the old timers and even many modern guideboat builders use quarter sawn (QS), rather that flat sawn (FS) planking. Quarter sawn planking expands less with moisture uptake compared with flat sawn planks. In many builder’s minds quarter sawn material, because it expands less with moisture uptake, is less like to crack along the seams. The downside is that quarter sawn wood is rather dull in appearance and does not display “figure”. I am a maverick on the QS versus FS argument. QS wood is an absolute necessity when there is water or liquid on one side and air on the other side of a wooden structure, say with old wooden sailing vessels or with barrels. In those cases you want to minimize the expansion of the wood due to moisture uptake on the “wet” side to prevent leaks. Does this apply guideboats? I don’t think it does. Guideboats are not continuously in the water but are hauled out after a few hours or even a day of rowing. So there is always the opportunity for the guideboat planking to rid itself of excess moisture. Another factor becomes important, especially with modern guideboat construction. 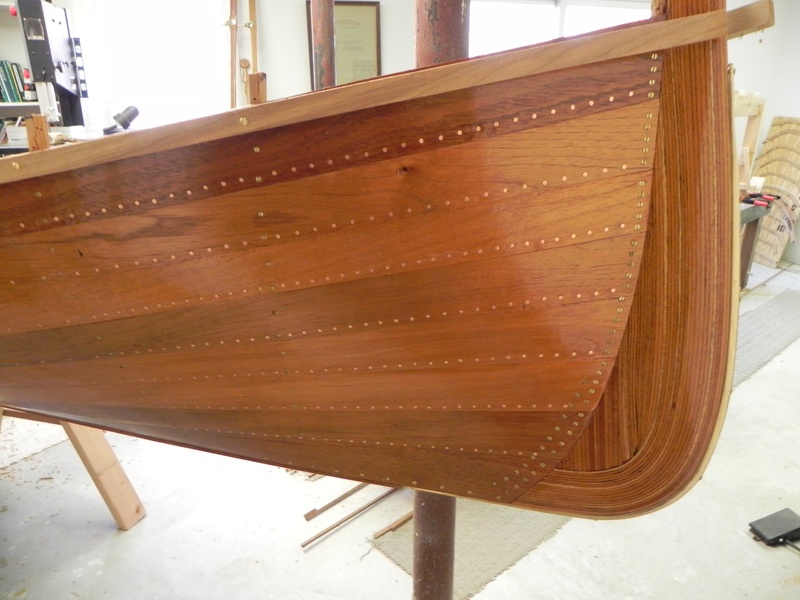 Boats today are finished with multiple coats of marine spar varnish. It has been shown that these coatings severely limit moisture uptake by the wood they protect. These two factors suggest to me that is perfectly OK to use flat sawn planking in guideboats. Wow! That really does pop. Looks beautiful! Previous post Building an Adirondack Guideboat-Why use hand tools?